He was born in Tokyo Nippori in 1924. He learnd "Edo Sato Kagura" under his father (third generation) from 7 years old. 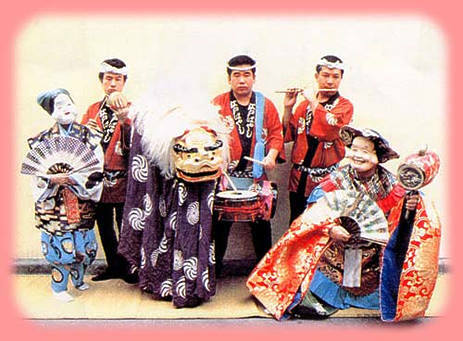 After end of the war,he entered in the U.S. military Ernie pile theatrical company and introduced "Kagura"in Japan. By the side he organized the "Kagura school", and makes an effort to the successor promotion. He gets tired only of the legend of the "Kagura" of the tradition art, it is not worth, takes the contemporary music and the play, announced what becomes an art recommending Minister of Education prize winning in the art festival popular public entertainments section grand prize winning and 1990 the art festival excellent prize winning of 58 years of 1976 and 2 degrees and 59 years back, and the truth is connected. It puts to say nothing of the country in various parts of the United States, Canada, and Europe, he performs, and it introduces Japan. Moreover, several-degree he participated in Asian dance festival. "Shishimai" originates though enshrined "Lion head" as "UBUSUNAKAMI" to purify the famine and the epidemic in the country of Ise in Edo Kanei year about 300 years ago. It is spread to Edo. "Is purified, and the world is celebrated. " The shade of the bringer of good luck is condensed, and the one that was established as not only the New Year but also the event held at each congratulation thing. Now "shishimai" is very Valuable. It piled up the seat of congratulation further.